We are a company that has developed itself from a pioneer in the field of quality-related software back in the 1980s to one of the global technology leaders for management software solutions today. We don’t limit continuous improvement to isolated issues but instead aim to put everything into perspective with regard to the big picture. If context and big picture are not drawn into consideration, continuous improvement only takes place at a small scale and may result in micromanaging processes which may need to be rethought in their entirety. We believe that one must always be prepared and ready to challenge every detail, process, and convention. Regardless of company size or line of industry: the requirements regarding management systems that are formulated in standards and regulations are in fact very similar. If one takes a closer look at said requirements, one quickly realises, that they merely differ regarding terminology, security aspects, and individual emphases. This reality lays the perfect groundwork for freely configurable standard software. 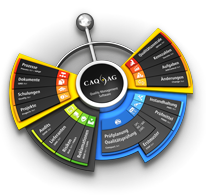 With the idea of standard software for quality assurance in mind, Hans-Jörg Brück, Klaus Schumacher and Michael Schwarz consolidated all the experience and know-how they had acquired during the development of project software since 1981 as well as their comprehensive knowledge in the areas of quality management training and consulting, to found CAQ AG Factory Systems in 1993. The customers of CAQ AG initially included small and medium enterprises in the automotive industry. These customers profited from the fact that they were able to perform and administrate a variety of software-related tasks such as installation, connection of peripheral IT, and design of evaluations and reports all by themselves without the need for assistance by developers or consultants of CAQ AG. This simplicity has ever since been an integral part of our company philosophy. Today our customer-base includes companies from within virtually all lines of industry and ranging in size from SMEs to multinational corporations, who all profit from the simple and straight-forward design of our software solutions. The key factors of our company philosophy are innovation, team-spirit, enthusiasm, and the ensuing long-term bonds with our customers and employees. Though it may seem somewhat unusual in today’s fast-paced IT-business, we are tremendously proud of the loyal and long-lasting employment relationships and the unusually long ties to our customer-base we enjoy. We see ourselves as tool and solution provider for our customers, as our software enables them to implement superior processes and produce high-quality goods. The product quality has a direct impact on the success of a company and we believe that we and our solutions directly contribute to said success. Hence, we are not only proud of our own products, but primarily proud of the products of our customers. Our products may not be the cheapest on the market, but we never intended to be the cheapest provider. We, instead, aim to always provide our customers with the best, most sophisticated and up-to-date software solutions the market has to offer, in order to support them on their journey to success. IV. What does the future have in store? We are a modern IT-company that consistently orients itself toward the latest technologies. However, we always operate with an adequate degree of caution and do not blindly follow the latest IT-trends. Devising, improving, and upholding complex IT-processes has always been our game. However, we believe that in the near future every company from within every line of industry will be facing very similar challenges to those that IT-companies like us have been facing and continue to face every day: every company will in part become a little more of an IT-company. Hence, IT-systems that are linked via intelligent interfaces as well as the digital management of company processes will become ever more important for companies in order for them to be able to uphold and increase their competitive edge. Now right here is where our strengths lie, because we know and understand these processes and how important the comprehensive linkage of systems is. As far as we’re concerned, industry 4.0 and Computer Integrated Manufacturing are just other words for what we do every day and always have been doing for our customers. We are your reliable partner in all matters relating to quality and will support you throughout whatever the digital future may bring.